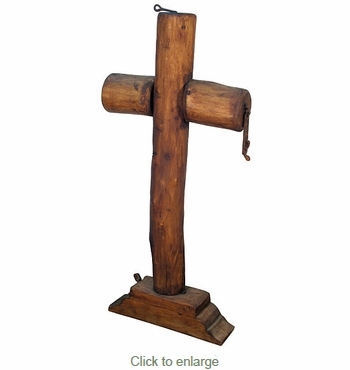 This hand made large standing floor cross is carved from pine timber and has rustic iron accents. This beautiful cross is has a simple look and simple southwest carved design. These beautiful crosses are handcrafted in Mexico by talented artisans. Each wooden cross is unique and one of a kind, expect variations from the photo shown.